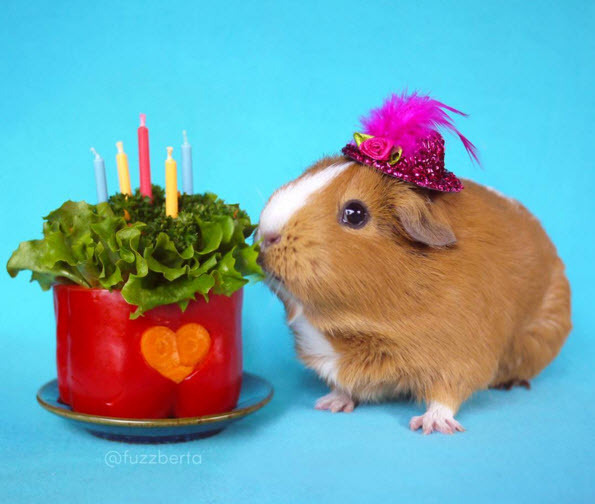 Use a teacup to make a leafy birthday cake for your guinea pig! Get a teacup that is short enough for your guinea pig. Break off the top of pieces of lettuce to be slightly longer than the height of the teacup. Wash the lettuce, gather it into a bouquet, then put the bouquet in the teacup. Add more pieces of lettuce if needed, then tuck candles into the lettuce or use thin slices of colorful veggies as candles instead. Watch out for any candle wax drips on the lettuce if you light real candles.